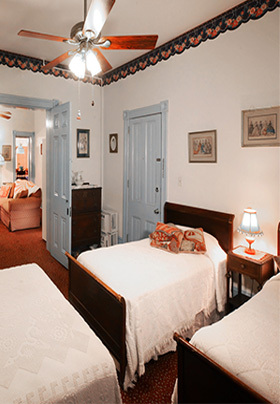 Instead of booking a vacation rental in Cape May, enjoy the benefits of Antoinette’s Apartments & Suites when traveling with your group: in-house entertainment pastimes, outdoor gathering areas, beach gear, and more. Our Filomena Suite (#1) is a 1200+ square-foot luxury suite, perfect for up to eight guests. With two bedrooms and 1 1/2 baths, this beautiful suite offers a welcoming getaway. The Filomena Suite is tastefully appointed with both antique and contemporary furniture, handmade curtains, drapes and Victorian lampshades. The kitchen features an antique oak dining room set and antique highchair. The 50-spring Victorian couch in the living room was lovingly hand-upholstered (300 hours+). The fireplace is a gas-log to add warmth and charm to this comfortable suite. During the Christmas holidays you’ll find a nine-foot Christmas tree and other festive decorations in the room, including presents under the tree. A complete living room with one queen-size Victorian couch with a queen sofa bed, flat-screen TV, VCR, DVD and stereo. Romantic working gas-log fireplace, usable during fall and winter months. 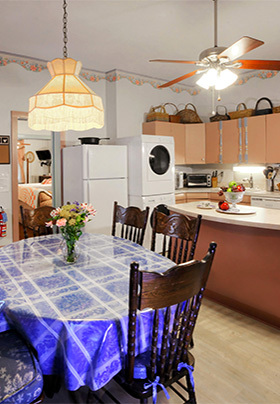 Large and spacious fully equipped eat-in kitchen with gas stove, microwave, coffee pot, dishwasher, refrigerator, washer/dryer, extra-deep kitchen sink and TV. Large master bedroom with a queen-size bed, two twin-size beds and flat-screen TV/DVD. Small, private second bedroom with a queen-size bed and TV. Large 18,000 BTU room air conditioner in living room, window A/C in bedrooms, and ceiling fans in all rooms. Private entrances from the rear kitchen and/or master bedroom. On-site parking for up to two cars. I had a wonderful time at Antoinette’s Apartments &amp; Suites There was great service and wonderful rooms. Deanna was very friendly and nice. Last time we were here and liked it so much. I’m the reason we came back to Cape May and because I liked it so much I begged to come back to Antoinette’s and even wrote a paragraph about it here. My assignment was “if I could go anywhere I like over spring break where would you go?” I chose Cape May because of the beaches and of this hotel. I love it here and hope to come back soon.